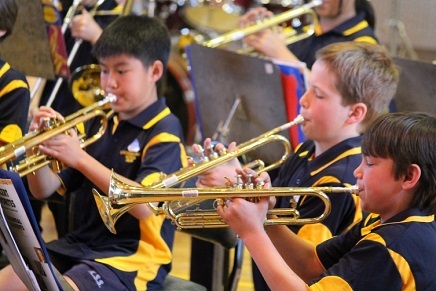 Kingsford Smith School offers students the opportunity to apply for the Year 5 and 6 school brass band program run through the IMP (Instrumental Music Program). The aim of the program is to provide students with technical and artistic music performance skills. This is achieved through the operation of special classes in which instruction is given on brass and percussion instruments. The size of these classes is limited (for practical and educational reasons) to a maximum of 22 students. For a relatively small tuition fee students receive an exceptional introduction to music. As part of our program students have the opportunity to perform at school assemblies, fetes, special events and at several outside school venues. This culminates in a final performance at the Year 6 Bandstravaganza at Llewellyn Hall.